Undeniably good looking, the Acer Aspire U all-in-one delivers a classy desktop computing and multimedia experience. Read our Acer Aspire U review to find out more. Should I buy the Acer Aspire U? Done up in black and clear plastic, the Aspire U has a clean, modern look. The computer looks like an oversize picture frame, supported in the front by a clear plastic panel running its width and in the back by an articulating kickstand. This design lets you angle the Aspire U from nearly flat on the desk to nearly straight up. It’s an effective design if you have plenty of desk space or table area to work with. If you want to buy an all-in-one to maximize storage area in a small workspace, forget it: The area behind the Aspire U is completely blocked off. See all of our All-in-One PCs reviews. The styled-to-match wireless keyboard and mouse bundled with the Aspire U are both pleasant surprises. The keyboard has a slightly sloppy feel, but the keys offer plenty of travel and feel quite nice overall. The up and down arrow keys are half-size, which makes them difficult to use, but the keyboard includes a numeric keypad that you can use for navigation (when Num Lock is turned off). The mouse has a nice heft, and it tracks well on just about any surface. Take a look at Group test: what's the best all-in-one PC? The touchscreen display responds well to finger movements, and the Aspire U has one of the nicest webcams out there. It’s HD, and it provides very smooth video—significantly smoother than usual. The Aspire U can also respond to hand gestures via said webcam, though in truth it's a rather strenuous and inaccurate way to navigate Windows. The A5600U-UB13 model of the Aspire U that we tested was sprightly enough, subjectively—once the Windows 8 operating system worked its caching magic. Until things were cached, however, the sluggish 1TB, 5400-rpm hard drive caused windows and applications to open rather slowly. This is a machine that you’d rather have hibernate or sleep than shut down, lest all that caching go for naught. Acer doesn’t offer an SSD option, which would have worked miracles in both perceived and actual speed. The A5600U-UB13 is a middle-of-the-road performer, which is why PCWorld decided to use it as the reference machine for Desktop WorldBench 8.1 tests. It’s powered by a dual-core Intel Core i5-3230M mobile CPU (all-in-ones often use mobile components because they don’t require as much cooling) and 6GB of DDR3/1600 memory. As is typical of lower-priced AIOs, the A5600U-UB13 relies on the Intel HD 4000 graphics processor integrated into the CPU, so don’t expect to play hard-core games on this machine. Although it managed to squeeze out 47.5 frames per second in Dirt Showdown (at a dialed-down resolution of 1024 by 768 pixels and with visual quality set to low), it ran Crysis 3 under those same settings at less than 18 fps. The 23-inch display has a native resolution of 1920 by 1080 pixels, and it offers both an HDMI input (a convenient feature for connecting a gaming console, a cable/satellite set-top box, or a Blu-ray player) and an HDMI output (great for connecting a second display). A tray-mount DVD burner (not Blu-ray) sits on the right side. You’ll find two USB 3.0 ports, a card reader, and microphone and headset jacks on the left side. As the front edge of the Aspire U is always in contact with the desktop, you have to turn the unit around or lay it on its face to access the ports in back, namely three USB 2.0 ports, gigabit ethernet, and the aforementioned HDMI connections. The machine is outfitted with 802.11 b/g/n Wi-Fi and Bluetooth 4.0 adapters, so you can keep cable clutter to a minimum with just the one cord running to the external power brick. Movies look very nice on the Aspire U. In the owner’s manual, Acer describes a remote control and coax input, but the U.S. models have no TV tuner, and the coax input is missing in action. Standard input-select and up/down navigation controls are on the lower-right side. Sound from the Aspire U is clear, but thin. Acer would do well to copy Vizio’s example of providing a subwoofer with its all-in-ones. Most AIOs are difficult to open, but with only two screws on the back of the Acer A5600U-UB13, I decided to see if it was upgradeable. Acer says this voids the computer's warranty, but there are no anti-tamper stickers, so there's little warning to consumers who buy one. There's an mSATA slot inside, hidden on the back of the motherboard, and easier-to-access mini-PCIe and SODIMM slots on the front of the motherboard. The hard-drive caddy is in plain sight, held in place by a single screw. Upgrading the memory or adding an internal TV tuner would be easy. Upgrading to an SSD? No so much. Replacing the hard drive is no problem, but you would need a very capable cloning program that understands UEFI. The Aspire U is one of those rare computers with a UEFI BIOS that doesn't support booting from legacy MBR media. That means you can't boot from a flash drive or even normal optical boot discs (although it did boot using a factory-pressed Windows 8 DVD). There is a utility called Rufus that will create UEFI boot media, but the lack of legacy boot capabilities is a serious barrier to repair, recovery, and testing other operating systems. Acer does make a non-UEFI BIOS available on its website, but we were unable to cross-grade to it. 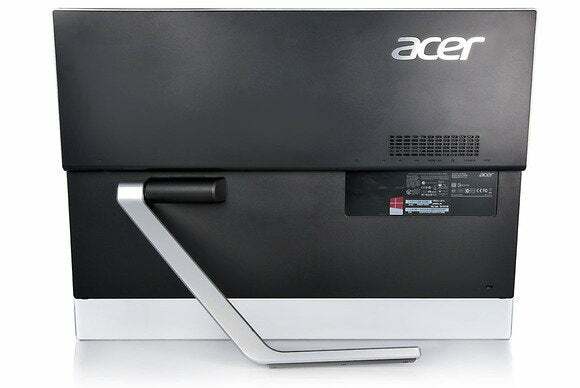 Because of the warranty and boot issues, Acer said that consumers should contact the company about replacing failed components, such as a hard drive. Perhaps you can live with that for the warranty period, but the UEFI BIOS issue could be problematic after that. When all is said and done, the Aspire U is an attractive mainstream family computer with average to good components, performance, and features. It's a good pick for those on opposite sides of the spectrum: People who never see themselves repairing or upgrading their own computer, and tech-savvy types who want an upgradeable AIO and are capable of working around the UEFI issue.